This review first ran in the May 26 edition of The Hamilton Spectator. We’re the Ambitious City. But are we a caring city and a deep community? There are lots of reasons to think so. Hamiltonians look after our own. We’re generous with our time and money. Local employers can be counted on to step up and help make our city an even better place to call home. But fault lines start to show on hot button issues like bike lanes, one-way street conversions and light rail transit. You’re with us or against us is a recurring refrain in letters to the editor, online comments and blog posts. Not a fan of scrapping one-way roads? Then you’re an SUV-driving, stuck-in-the-1950s suburbanite who thinks racing through our lower city streets to get somewhere else in 20 minutes or less is your birthright. An LRT supporter? Then you’re a Millennial hipster who pines for Portland and wants to play a real world version of Sim City with tax dollars we don’t have to swap blue collar buses with white collar trains so the creative class can ride in comfort. These tired stereotypes are untrue, unhelpful and if unchecked, can slide us into what Paul Born calls a fear-based community. Deep community is where we need to be. “To deepen community is to find opportunities for ongoing connection with those we care about and those who care about us. This connection strengthens the bonds between us,” says Born. We start to act together for the benefit of all. Enjoy one another by spending time together. Work together to build a better world. Ask Born what’s the most important thing we can do to make a difference in the world and he’ll tell you to bring chicken soup to your neighbor. It’s a simple solution that takes a lot of work upfront. You need to build a relationship with your neighbour before she’s under the weather. “The work takes place long before you perform the act of bringing soup,” says Born. The same holds true with building a deep community. 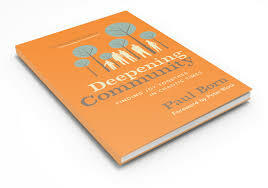 Whether at work or at home, deepening community is everyone’s responsibility. This review first ran in the May 12th edition of The Hamilton Spectator. Greg Maychak from the City of Hamilton paid our senior management team a visit last month. Maychak gave us a presentation on the 2015 Pan Am Games and made a pitch for volunteers. Maychak’s pretty passionate about the Games and he made a strong case for why we should share his enthusiasm. About a third of all tickets sold for the Pan Am Games will be for the 32 soccer matches to be played at Tim Hortons Field in Hamilton. More than 300,000 people will be in the stands and then celebrating in our streets over 16 days next July. The Games will showcase Hamilton to the Americas and inject a pile of money into our local economy. It’s going to be a very good summer for restaurants, bars and pubs along James Street North. I put away my smartphone and gave Maychak my undivided attention because he did what all good presenters do. You do that by entertaining, educating, persuading, motivating and ultimately changing your audience. 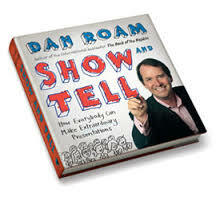 To deliver an extraordinary presentation, follow what Roam calls the three rules of show and tell. Lead with none of the above and you inflict death by PowerPoint on an audience that’s not paying attention. When you tell the truth, you connect with your audience, you become passionate about what you’re presenting and you find your self-confidence. Audiences are perceptive and will tune you out if you’re stretching or dodging the truth. When you tell a story, you make complex ideas clear, you make your ideas unforgettable and you make everyone feel included. He claims all presentations can be delivered using just four storylines. The report storyline conveys facts and changes the audience’s information. The explanation storyline teaches new insights, changing our knowledge or ability. The pitch storyline recommends a new solution that changes our actions. And the drama storyline inspires a new way of looking at the world and changes our beliefs. Think of storylines as a guide rope that connects you with your audience. “As presenters, it is our job to keep this line taut and moving,” says Roam. You keep that line from going slack or getting tied in knots by showing pictures. When you tell us a story with pictures, we see exactly what you mean, you grab and keep our attention and you banish boredom. According to those in the know, more of our brain is devoted to vision and visual processing than other known functions, including language. “If our eyes don’t have something interesting to look at, we will make stuff up.” A PowerPoint slide jammed with text and charts that no one can read is not interesting. According to Roam, any story can be illustrated using just six pictures: portraits, charts, maps, timelines, flow charts and equations.